An alternately delicate and brutal retelling of the memoir by former World War II British Army officer Eric Lomax, "The Railway Man" is an impressively crafted, skillfully acted, highly absorbing journey into a dark corner of world history. Colin Firth plays Lomax in 1980, more than 35 years after being tortured at a Japanese labor camp in Thailand. He learns that Takashi Nagase, the Japanese interpreter at the helm of that cruel, unforgettable punishment, is still alive. Lomax will eventually cross continents to confront his erstwhile captor and hopefully quell the post-traumatic stress disorder that has plagued the self-dubbed "railway enthusiast" for decades. The film, as directed by Jonathan Teplitzky from a script by Frank Cottrell Boyce and Andy Paterson, takes anything but a direct approach toward that tense, final showdown between Lomax and Nagase (Hiroyuki Sanada). Instead, it effectively toggles between the latter-day Lomax as he meets and marries the compassionate Patti (Nicole Kidman) as a former nurse who struggles to understand her tight-lipped new husband's longtime trauma) and flashes back to a young Lomax's (Jeremy Irvine) horrific time as a prisoner of war under the young Nagase's (Tanroh Ishida) iron thumb following the 1942 fall of Singapore. The nightmare of the military conflict and the attendant torture, all set against the inhumane construction of the Burma-Siam Railway (a.k.a. the Death Railway), are grippingly re-created. Low key but equally compelling are the emotionally resonant scenes of the Lomaxes navigating their early days of marriage, times that swing from idyllic to fraught based on Eric's often crippling PTSD. A fine Stellan Skarsgård also appears in the pivotal role of Finlay, Lomax's best friend and fellow labor camp detainee (played in flashback by a strong Sam Reid), who crosses a line to help Patti better understand her husband's anguish. Superb cinematography by Garry Phillips and a stirring score by David Hirschfelder add much to this powerful, evocative film, which is capped by a cathartic coda that might have felt a tad too "cinematic" had the events not actually taken place. 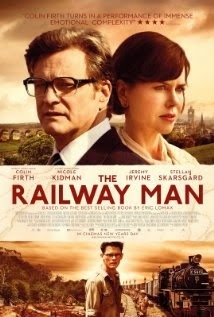 The grim experience of a Scottish man tortured in a Japanese labor camp during World War II forms the backbone of The Railway Man. But for a well-acted movie about the horrors of war and the lure of revenge, it's surprisingly dull and starchy (**1/2 out of four; rated R; opens Friday in New York and Los Angeles). Colin Firth is sadly repressed as Eric Lomax, a former British army officer suffering from flashbacks and what would today be labeled Post-Traumatic Stress Disorder. He is superbly low-key as he stoically withstands his inner torment, bringing characteristic gravitas to the role. Based on Lomax's autobiography, from which the film takes its name, the story flashes back and forth between the early 1980s, when the middle-aged Eric meets Patti (Nicole Kidman) on a train and falls in love with her, and the early 1940s, after the fall of Singapore and during his wartime incarceration in a prison camp in Burma. The prisoners of war were made to work on building the Thai/Burma railroad while enduring hideously vindictive treatment. 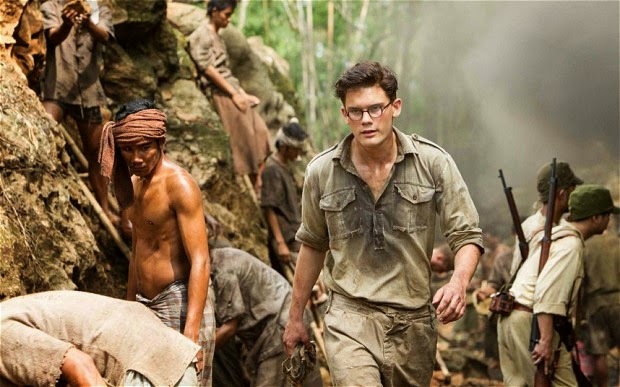 As a young soldier Eric is played by Jeremy Irvine, who does a terrific job in the role. During his time in the camp Eric fashions a crude radio in order to establish connection with the outside world. When the Japanese authorities discover it, he's savagely tortured. The brutality is overseen by young interpreter Takashi Nagase (Hiroyuki Sanada). 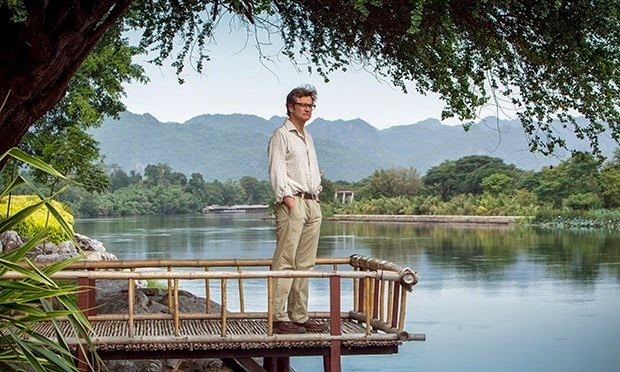 Though his life took a decidedly positive turn when he married Patti, Eric grows withdrawn and increasingly haunted by his experience in Burma. Despite his happy marriage, his demons begin to overtake him. He attends regular meetings with fellow ex-prisoners of war, though these are hardly group therapy sessions. The men don't do a lot of talking. His closest friend among them is Finlay (Stellan Skarsgard), who urges Eric to track down Takashi. Patti also turns to Finlay to attempt to understand what is plaguing her taciturn husband. One can't help but wonder how Eric coped in the decades between his incarceration and the time he met Patti. Kidman is not given much to do except be expressionlessly supportive in a non-showy role. Their initial romance is dispensed with in a series of sentimental montages, then she spends much of the rest of the movie looking mildly concerned. The film's climax takes Eric back to Burma to face down Takashi, who is working as a tour guide at the same prison camp where he oversaw the barbarous treatment of Eric. He says he is there to expiate his guilt, and insure that later generations don't forget what happened there. Eric, in his slow-burning anger, won't accept his apologies. Their meeting, however, lacks the drama it should after all the intervening years. Eric has the opportunity to inflict pain upon Takashi, but rises above such base instincts. Ultimately, Eric forgives his abuser and the pair become lifelong friends. Though both Firth and Sanada are excellent in their parts, they are limited by the bland script by Frank Ctrl Boyceand Andy Paterson, which doesn't do justice to the subject matter. It's no doubt challenging to visually depict emotional healing and catharsis, to delicately balance the darkly savage material with the uplifting, tender conclusion. As a celebration of compassion and forgiveness, the film is laudable. But the slow drama, as directed by Jonathan Teplitzky, suffers from a plodding pace and cliched dialogue, undercutting much of the power of an inherently fascinating account. The historical drama makes the viewer wish they'd read the book rather than watched the movie. So have you decided? Will you be watching or not?